The company that operates an electric vehicle rental pool in San Diego announced Thursday that 6,000 members signed up in the first 100 days of the program, in part because of the recent spike in gas prices. More than 25,000 trips have been made in its 300 EV vehicles in San Diego, according to car2go North America. "For the first time in the history of North America, an entire city has been given access to a large network of electric vehicles that they can share, collaboratively," said Nicholas Cole, president and chief executive of the company, a subsidiary of Daimler North America. "As thousands of residents of San Diego embrace car2go and the electric vehicle driving movement, they are setting an outstanding example in emissions-free urban mobility for the rest of the world," Cole said. Users of the service locate their rental via their Smartphone, computer, by phoning a call center or coming across one parked on the street, and drive away. Members can also reserve a vehicle up to 24 hours in advance. There is no mandatory return time or location, and the driver only pays for the time he or she used the car. The company charges 35 cents per minute, up to $12.99 per hour and a daily maximum of $65.99. 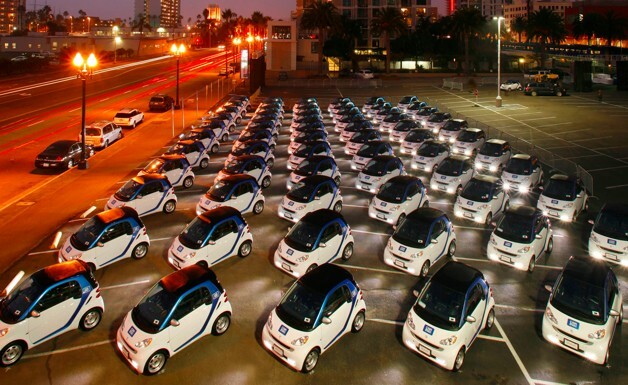 According to car2go, at the beginning, around 500 rentals were happening each week. Now, it's up to 3,500, averaging between 15 minutes and a half-hour. The average distance driven is between five and 10 miles. "At a time when the cost of fuel is reaching record-high prices, San Diegans are looking for ways to reduce their dependence on fuel and for more cost-efficient modes of transportation; and car2go is a very logical choice for them," Cole said. The company also operates car-sharing programs in Austin, Texas; Vancouver, B.C. ; and in Europe. The concept is being introduced in Washington, D.C., and Portland this month.